Now, if you follow along on Twitter, you probably know that I had not seen the cult-acclaimed Firefly when it ran originally, or in the succeeding ten years. 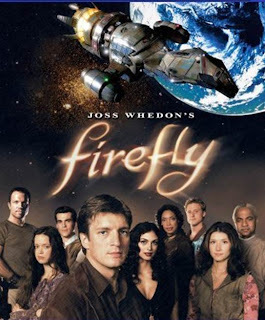 In fact, I just whipped through the 14-episode series a couple of weeks ago, after being lulled in by a combination of my husband's insistence and wanting to know what all of the fuss was about after witnessing the crazy Browncoats fans at Comic-Con. An upcoming post will feature my thoughts on the series, but today let me draw your attention to the fact that someone took 475 hours to use 70,000 Legos to build their own Serenity, which is the Firefly spaceship. There are a ton of great photos there and the attention to detail is amazing, so it's definitely worth a few minutes of your time! And, even if you're not a Firefly fan, I encourage you to just take a peek... it's some magnificent craftsmanship. And, to help you out, here's a look at what the ship and its crew looks like. Also, I should note that tis isn't the first attempt to re-create the iconic spacecraft in Legos - in fact, I found this one dating to 1995 - but I would be utterly shocked if there's a better depiction out there than the one 21 months in the making!